Portrait by Margaret Holland Sargent of Jules Stein, Founder and CEO of MCA (Music Corporation of America), and The Jules Stein Eye Institute. 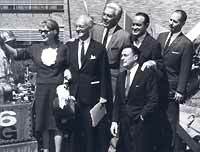 Groundbreaking photo of The Jules Stein Eye Institute: Bette Davis, Ceasar Romero, Bob Hope, Gene Kelly, and architect Rodney Hemwith. Opthamologist, Founder, and CEO of MCA (Music Corporation of America), our client Dr. Jules Stein was and remains known, as the foremost benefector in the world of vision science and blindness prevention. He combined his love for music and medicine to produce a lifetime of celebrated achievement as musician, physician, business leader, and humanitarian. ISA proudly took care of all the staffing needs for Jules and Doris Stein.